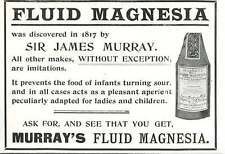 James Murray born in Ireland created his Fluid Magnesia that came to be known as Milk of Magnesia. The antacid effect of Magnesium had been known for some time but making a palatable oral liquid had proved difficult. 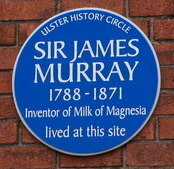 Murray patented a production process for ‘fluid magnesia’ as a mild laxative and antacid, setting up a factory in Belfast to produce the medicine commercially. By-products of the process included sodium, potassium bicarbonates and silicates, which when treated with sulphuric acid could be used as an artificial fertiliser. 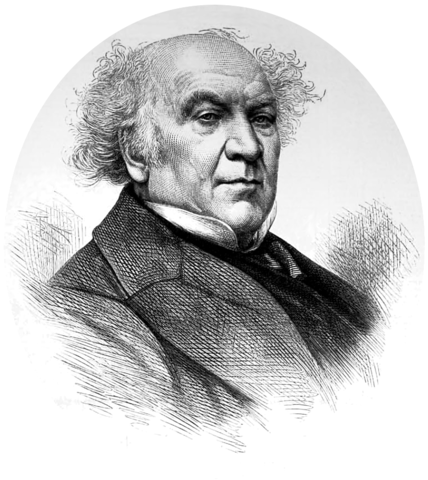 In 1829, Sir James Murray used a "condensed solution of fluid magnesia" preparation of he created from Magnesium sulphate to treat the Lord Lieutenant of Ireland, the Marquis of Anglesey. His treatment was so succesful he was appointed resident physician to Anglesey and knighted. Phillips an English pharmacist received a patent in 1873 for hydrate of magnesia mixed with water which he called Milk of Magnesia. 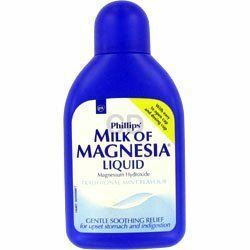 In 2013 the European Union insisted Milk of Magnesia was reformulated with less Sulphate.